If you’re relying on the weather for your power, prepare yourself to live without it: South Australians know the drill very well. In yesterday’s post, we focused on 25 January the day when Victorian wind power output struggled to produce 20% of its nameplate capacity, and 200,000 households struggled to survive without air-conditioning, or any of those other creature comforts one expects in a (notionally) first world country. In this post, we’ll wind the clock back 24 hours and take a look at the chaos that reigned in both Victoria and South Australia. The graphic above is a snapshot of the debacle in South Australia, where more than 26,000 households were left powerless on a very hot summer’s evening (the figure increased after that). Be warned that the story below is a mixture of hysteria and RE propaganda. South Australians and Victorians get to deal with the hysteria, STT will unpack some of the propaganda below. 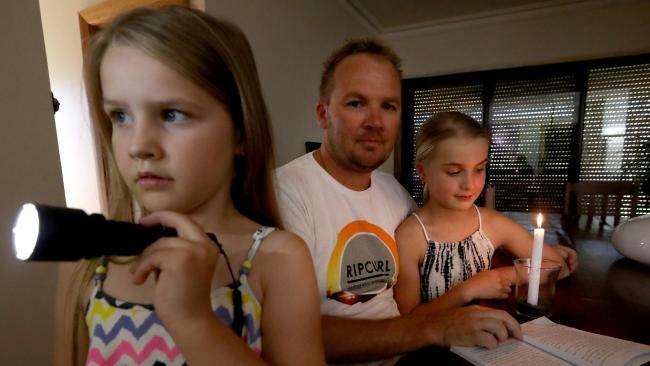 South Australia has been hit by a major electricity blackout with more than 20,000 households to endure a night without power after a severe heatwave buckled local poles and wires networks and stretched the state’s grid to breaking point. 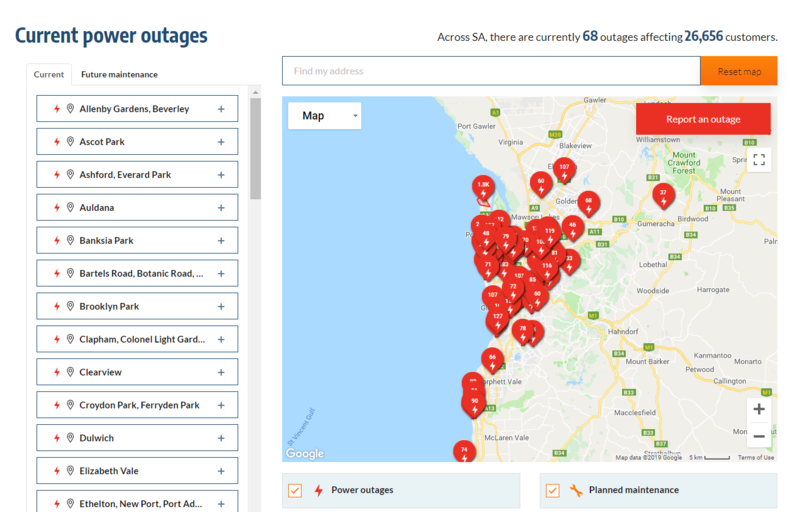 Power was knocked out from 90 ‘poles and wires’ transformers on local streets after electric fuses shut down due to record temperatures with more than 21,000 homes losing access to electricity, SA Power Networks confirmed. The fresh power crisis comes just over two years after the entire state was plunged into darkness when powerful storms knocked out 22 power pylons which triggered a shutdown in the electricity network. 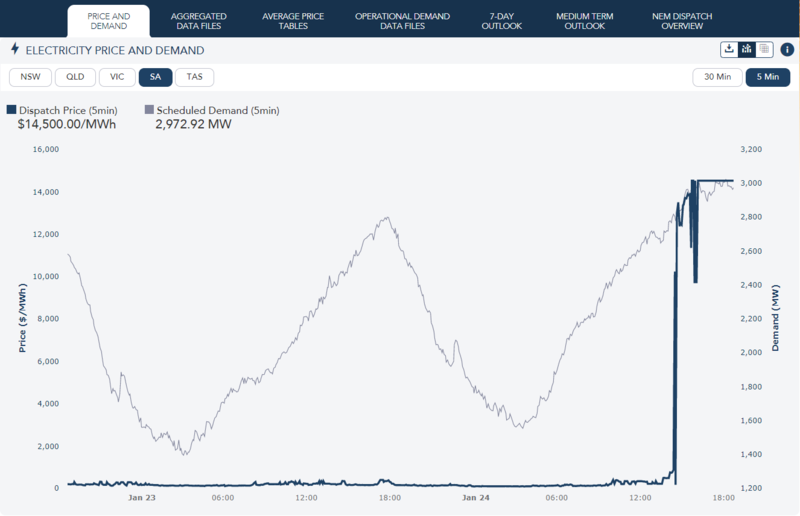 Searing heat caused chaos across Australia’s fragile power market today as demand outstripped supply, forcing the market operator to order Victoria’s largest electricity user to cut its power use tonight to help balance the power system. Adelaide hit a new record of 46.6 degrees on Thursday afternoon while Melbourne topped 40 degrees, ratcheting up demand on the power system. The South Australian towns of Whyalla, Wudinna and Tarcoola were all forecast to reach 48C today, with towns in Victoria’s northwest headed for 46C tomorrow. The state’s Portland aluminium smelter run by Alcoa was told to lower its power use between 7.10pm and 8.50pm east coast time to help secure the power system after earlier agreeing to free up 400 megawatts of supply to dodge enforced electricity cuts. Earlier, AEMO chief executive Audrey Zibelman said the market operator had called on 400 megawatts of additional energy reserves involving contributions from both commercial and residential customers who had been contracted by AEMO as a hot weather contingency. A combination of extreme weather and faulty power plants saw the market operator ask customers in the two states to cut their power usage in a process called ‘load shedding’ to help ease pressure on the grid and keep the lights on. Consumers were also asked to avoid using dishwashers, washing machines and pool pumps during peak times and lower their blinds before going to work to cool houses and lower demand. 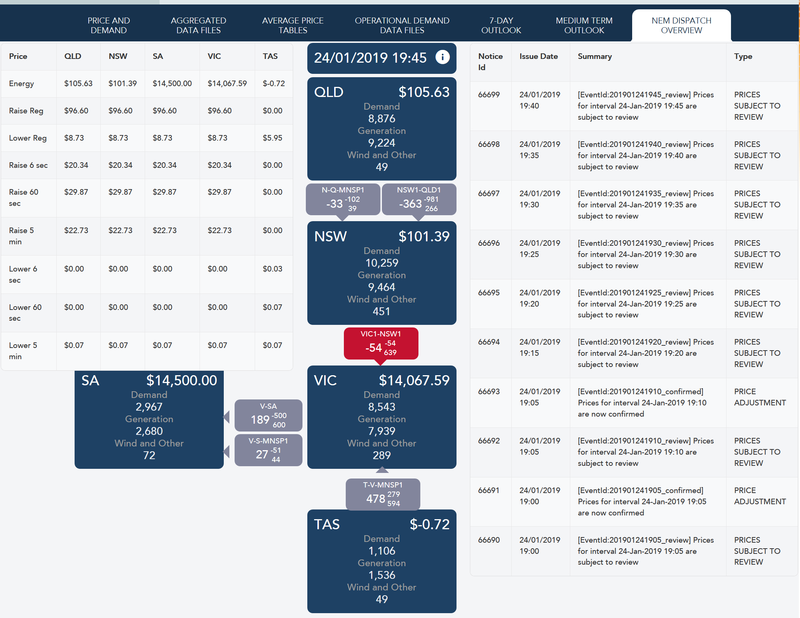 Spot power prices in Victoria soared to $14444 a megawatt hour on Thursday night with South Australia spot trading even higher at the maximum of $14500 a MWh, AEMO data shows, compared with average prices of about $100 a MWh. 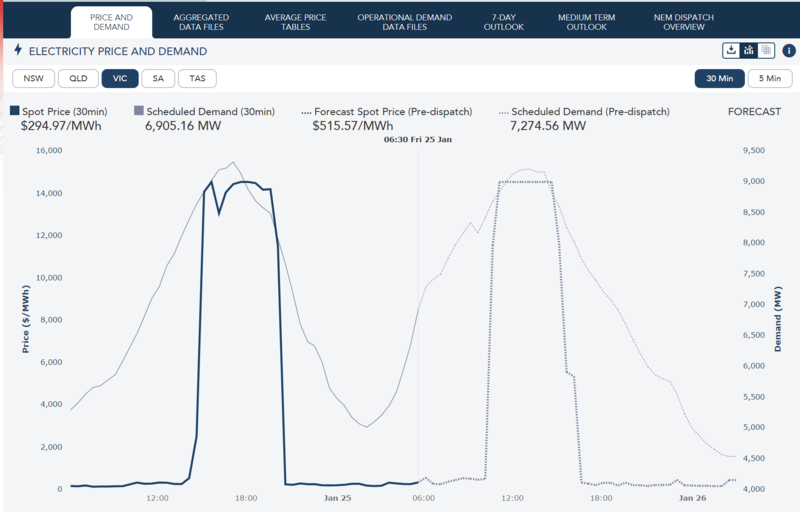 Prices in both states are forecast to remain at the maximum of $14500 a MWh until Saturday. South Australia’s controversial diesel generators – introduced by former Premier Jay Weatherill as a response to the state’s 2016 blackout – were also called on for the first time. Power was initially sent to supply-short Victoria, as the grid struggled to cope following the loss of over 1500 megawatts of baseload coal and gas generation from some of the nation’s largest suppliers this week. The state’s Whyalla steelworks owned by billionaire Sanjeev Gupta also cut its consumption today to help support the system, a spokeswoman confirmed. In South Australia – which typically relies on renewables for half its power needs – wind supplied less than 4 per cent of the state’s electricity today. Gas generators did the heavy lifting accounting for 82 per cent of generation with diesel also chipping in part of the balance. Victoria was in a similar position with wind supplying 3.8 per cent of the state’s requirements as brown coal, gas and hydro were deployed to meet rising demand. The decision to invoke load shedding marked an abrupt turnaround after Ms Zibelman had earlier said she expected there were sufficient reserves to get through the peak period. “At this point we’re in a position where we anticipate we have enough resources to get us through the peak,” Ms Zibelman said this afternoon. However, AEMO was forced into the measure several hours later as a result of a shortfall of available generation reserves. Resources Minister Matt Canavan said more needed to be done to ensure reliable power. Ms Zibelman said AEMO did not anticipate blackouts tomorrow, with a cool change expected to cross South Australia, reaching Melbourne about 3pm. “We’re not expecting blackouts and we’re not yet expecting to call on reserves. We’ll re-evaluate that again in the morning,” Ms Zibelman said. Earlier on Thursday the grid suffered a fresh setback after the failure of a unit at AGL’s Liddell coal-fired power plant in NSW, marking the fourth major generator unable to supply full capacity to electricity users. The lost output from three ageing coal plants and a major gas generator during one of the tightest supply-demand periods of the summer underlines the fragility of the grid despite vast volumes of renewables boosting output over the last few years. In addition to Liddell’s outage, a 560 megawatt unit from AGL’s Loy Yang A coal station in the Latrobe Valley was knocked out of action on Tuesday due to a tube leak with repairs likely to take about three days. At Victoria’s nearby Yallourn coal-fired power station a 370 megawatt unit was also out of action due to regular maintenance cutting a quarter of the facility’s 1480 megawatt load. Owner EnergyAustralia said the works on the facility could not wait and it expects the unit back up and running next week. The energy operator’s 435 megawatt Tallawarra gas-fired unit in NSW also dropped out of service on January 17 due to a rupture in a cooling pipe and the company has yet to outline when it will resume operations. So much for the hysteria, now to the propaganda. From the headline onwards, The Australian’s guileless reporters merrily trot out the line about “ageing coal plants” failing when they were needed most, blah, blah, blah. As we noted yesterday, there is a total of 23,360 MW of coal-fired plant connected to the Eastern Grid (which excludes WA and the NT), comprising 10,240 MW in NSW, 8,390 MW in Queensland and 4,730 MW in Victoria. So, the 930 MW of coal-fired power that was lost at Liddell and Yallourn due to mechanical faults (all capable of prompt remedy) represented a piddling 3.9% reduction in the availability of coal-fired power on the Eastern Grid. Whereas, as the chaos struck Adelaide and its surrounding suburbs, the collapse in SA’s wind power output represented a failure to deliver 96.1% of SA’s wind power capacity. SA, Australia’s wind power capital, has a notional wind power capacity of 1,929 MW. Just before dawn, SA’s wind fleet was pushing out just on 1,360 MW. However, as temperatures rose and with it demand for electricity used to power air conditioners and the like, wind power output collapsed to a mere 76 MW, or 3.9% of notional capacity. 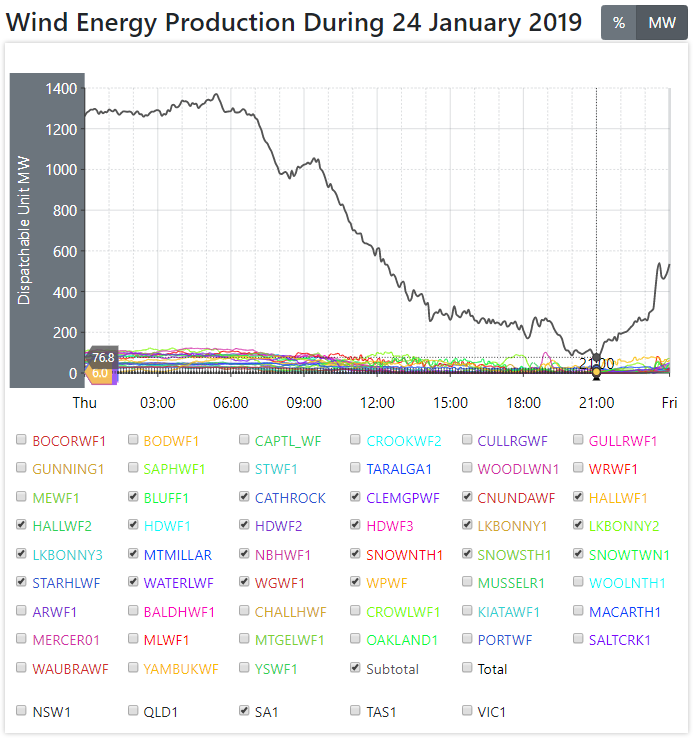 For some strange reason, there was nothing in the article above about the colossal 1,284 MW drop in wind power output over the space of a few hours, and at a time when South Australian households and businesses needed electricity most. But to focus on that kind of failure is unhelpful to the narrative, which tells us that we’re well on our way to an all wind and sun powered future. Oh, and by the way, for the uninitiated the sun drops over the horizon every day; in Adelaide it set around 8:27 PM last Thursday, and solar power output drops to a trickle a couple of hours before that. So, not only was wind power contributing nothing, hundreds of thousands of subsidised solar panels were just as useless. Part of the hysterical language used was that SA’s electricity infrastructure “buckled”. What occurred, in fact, was that a number of transformers were at risk of overheating and were shut down, and a very large unit within a substation at Fulham Gardens overheated and failed. One real possibility for the problems with transformers and other grid infrastructure involves the wild variability in voltage and frequency that accompanies the erratic delivery of wind and solar. Voltage surges (on occasions as high as 270 volts – the standard in Australia is 240) from uncontrolled domestic solar is already responsible for damage to appliances and grid infrastructure, and the risk of further damage has led to wholesale intervention on occasions, where the grid manager is literally chopping households from the grid to prevent them overloading it with excessive voltage. Then there’s the astronomical cost that results from that same chaos. The couple of hot days experienced on Thursday and Friday last week, saw demand increase in both South Australia and Victoria. In SA, having blown up its last coal-fired power plant last year, to meet the demand for 3,000 MW, the grid operator was forced to pay an extortionate $14,500 per MWh in an attempt to keep the system from collapsing. That figure represents the regulated market cap, it also represents a substantial margin above the $35 per MWh that SA’s last coal-fired power plant could reliably deliver power 24/7, whatever the weather. The graphic above depicts the five-minute spot price as the heavy blue line that prevailed on 24 January in SA, the graphic below covers the 30 min spot market in SA over the next 24 hours or so. After SA destroyed its last coal-fired power plants, it became even more dependent on coal-fired power from Victoria. When Victoria closed its Hazelwood plant in 2016, it lost 1,600 MW of reliable power, too. Now, both of these RE ‘superpowers’ struggle to find enough electricity to keep the lights on when the weather warms up, and wind power output plummets. Here’s what happened to the spot price in Victoria on 24 and 25 January 2019. On 25 January, as we reported yesterday, Victoria’s wind power output collapsed to around 20% of its nameplate capacity and 200,000 powerless householders were left sweltering, not to mention dozens of energy hungry businesses that were unceremoniously chopped from the grid, too. Despite bold assurances from Victoria’s Energy Minister, Lily D’Ambrosio that there would be “no blackouts in Victoria” on Friday. 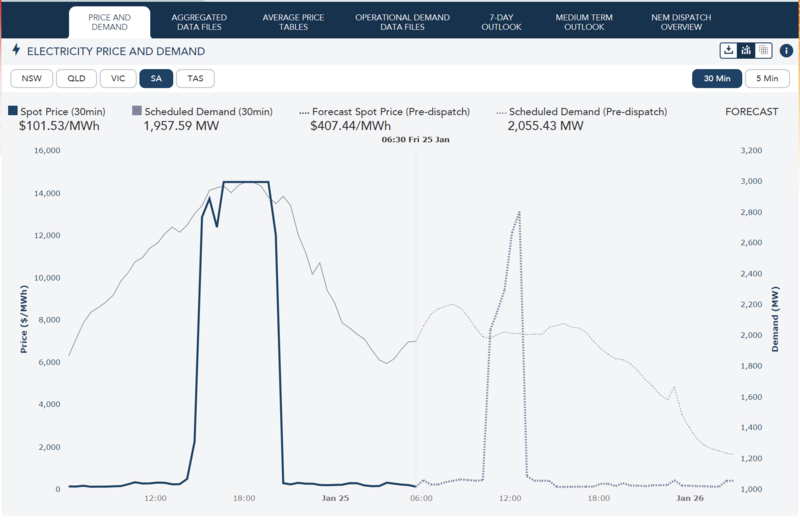 The spot price in both states was running north of $10,000 per MWh for lengthy periods on 24 and 25 January, naturally enough the average wholesale price hit the roof. As a result, South Australians and Victorians should brace themselves for more double-digit increases in their retail power bills this year. South Australians got whacked with a 22% increase, last year. 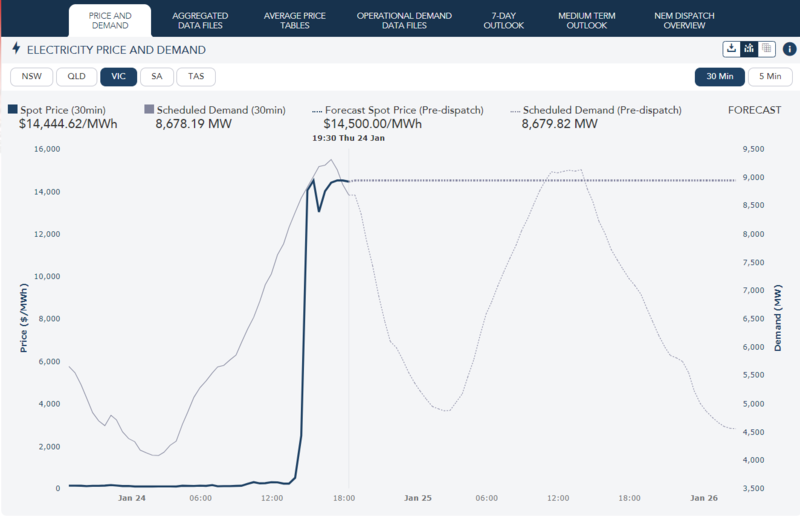 With all the hysterical criticism being directed at coal-fired power, RE zealots might note a slight difference between the prices prevailing in coal-fired Queensland and NSW: $100 per MWh compares rather favourably to the $14,000 plus per MWh South Australians and Victorians were being slugged, because either the sun set and/or the wind stopped blowing. Another ‘situation normal’ in wind ‘powered’ South Australia. What happened with the giant Tesla battery Musk had installed? I don’t read anything about it anymore. Batteries wont save you from blackouts because batteries dont generate electricty. One thing that has been missed by everyone – it was not just Adelaide and its suburbs that went black – we here in the lower SE did also and no doubt in other regional areas. At around 6.15pm our power went off, it took around 2.5 – 3 hours before it came back on. We sat in the dark unable to run a tap or flush a toilet as we are not on the mains system. We are used to pole and wires failures here – while they say it was that which was the problem what they fail to say is we were not the only areas to go black. So to did Mt Gambier and probably other areas. I do not believe it was just a case of the local poles and wires – why would they all go down at the same time? The constant harping on about another interconnector from SA and NSW will help us is nothing more than dreaming. NSW constantly even with their coal plants working to the max are not producing sufficient for their own needs so how will they be able to ‘save’ SA, and with SA dependent on the weather how can they be sure to be able to ‘sell’ energy to NSW. Mind you how they can say ‘we’ can sell energy to NSW when we don’t own the generators stumps me. The only ones who will profit are the wind, solar and battery owners – oh yes of course SA owns a ‘big’ battery – well they will when its been paid off, and that is going to save the day!!!!!! But it didn’t during the recent heat wave except to constantly kick in when there was a shock to the system to be overcome quickly – and that looks to have been almost constantly – but what happens when there is no wind to re-charge it – well lets wait and see shall we, I am sure they will come up with some fantastical explanation right out of children’s story books, or maybe they are hoping some ‘super’ hero will materialise wearing a cape and underpants outside their tights. The battery may have helped prevent a State Wide blackout, but why are we having to shut down industry and businesses and have rolling blackouts as if we live in a Third World country? The battery may have helped but it is not the answer, nor are the promises of more and more battery’s subsidised to go onto peoples homes – when they will be in need of replacement by the time people have paid them off – people will be in constant debt. Who will be paying for replacing ‘big’ batteries when they reach their use-by date? We as a State will be in huge debt for ever with our economy and industry dying a quick not slow death to pay for ideologically unsound policy’s decided by people who are so brain dead they cannot accept what is blatantly clear to many of us – these policies are not working and will never work. Bowing to demands of the UN without truly examining the effects of the demands was and always will have been a case of failed leadership by our Federal and State Governments – apparently from all sides of politics as it seems none are willing to stand up for the people of this Nation against the wailing of self interested nincompoops who use fear and imminent disaster to frighten people into falling over ourselves to join them in their hysteria. Unless we have people willing to stand up and be counted as people with brains that work independent of puppet strings then we are doomed. We can hope that the coming Federal Election will bring about a change – but there is no sign of that – yet – just talk about having to have reliable power generation – WHY have they not set that into motion, why have they sat back waiting while we fry or freeze. Why is our Federal Government so slow to trip the wires of constraint imposed by a group of foreign powers and failed politicians. The people of this nation are looking for a deserve Leaders that Lead with the people as their focus not some ideologically defunct meanderings of fools. The response from the pro wind brigade will be this only happens on really, really hot days. What they don’t realise is with each coal plant they destroy the lower the demand needs to be before this happens again. If we shut down Liddel then this will happen on hot and cold days, shut down Yallourn/Loy Yang and this will happen almost everyday. They are blinded by their ideology and will not learn until it is too late, actually I doubt most of them will learn even then. Plenty of them know, but either don’t care, or relish the ultimate result. There’s very little that can be said about the unfolding disaster that is Australias electricity supply system now run by politicians and a bunch of deluded lawyers. The present rag tag bunch of carpet baggers and their politician lawyer mates who are gaming the system and running down the once most efficient and cheapest state owned generation systems in the world now charge their consumers $14500 a MWh. In the real world this would make most people die laughing but in the Australian context these lawyers like Ms Zibelman can actually keep a straight face when extolling the disaster and blaming coal fired generation when she puts out a press release. The whole mess caused by the Marx Brothers running the countries electricity system and the carpet baggers deciding what the consumers will pay for their electricity after the Keating government forced the states to sell off their utilities in the name of competition policy to lower the price of water and electricity must rate as one of the biggest disasters ever to hit Australia, if not the world. As the madness and lunacy reach fever pitch by labor governments promising to install 100% cheap (LOLOL) solar power and the now obvious failure of sending a boy to do a mans job in Mat Canavan who has turned to jelly the future certainly looks very bleak for Australia. As I have said before there is no hope for the Australian electricity generation system as no one will ever take responsibility for the mess. Future governments with their ministers for energy will run with any loony scheme of the day to see out their terms in government. Australians should start investing in candles. Great report of what actually happened. Mainstream media wont report it because of the ratings. As for channel two, made their bed years ago. South Australia’s former energy minister and architect of a Greek style economy, young Tommy Kouts just can’t reconcile with himself not being in the limelight. With the current fiasco, with the use of his procured diesel generators and rolling blackouts in SA and Victoria, he has been hitting the airwaves and twitter. Don’t worry Tommy, you still hold the record, you managed to blackout a whole state!